Wilma Cozart Fine Interview with Bruce Dufie . . . . .
was held in 1995 and posted on this website in 2007. This notice about her additional honor was added in February, 2011. In addition to the GRAMMY Awards, The Recording Academy presents Special Merit Awards recognizing contributions of significance to the recording field, including the Lifetime Achievement Award, Trustees Award and Technical GRAMMY Award. Each year, The Academy invites friends and colleagues of Special Merit Awards recipients to pay tribute to the honorees' career accomplishments, while also adding colorful anecdotes and personal accounts. In the days leading up to the 53rd Annual GRAMMY Awards, GRAMMY.com will present the tributes to the 12 Special Merit Awards recipients for 2011. The words Wilma Cozart Fine lived by were "trust your ears." This was the guiding principle that defined her working life. For those who don't know the name, hers was a working life to remember. Cozart Fine, who died at age 82 in September 2009, was the recording director for Mercury Records' Living Presence classical recordings during the mid-'50s and '60s. And yet, the recordings she produced, though more than 50 years old, even by contemporary standards, sound as fresh on the original LPs and remasterings on CD (she supervised the latter) as any two-channel CDs being issued today. Cozart Fine was a creature of seeming contradictions. She was a pragmatic, hardheaded visionary, the sharpness of whose business and artistic judgments were matched by the acuity of her hearing. She had an exact memory of the sound of the music she heard and used that as a reference with which to assess any reproductions of it. She started working for Mercury when it was largely a pop label, taking over its quite small classical division. She built it into a force to be reckoned with, imitated by all the major American labels of the time, even RCA Victor. She signed Antal Dorati (whom she had worked for with the Minneapolis and Dallas Symphony Orchestras, the latter of which she served as his personal secretary and later as de facto manager), Janos Starker, Byron Janis, Paul Paray, Frederick Fennell And The Eastman Wind Ensemble, and the Chicago Symphony Orchestra, among others. She oversaw the first American recordings made in Cold War Russia, and developed marketing innovations still copied to this day. Cozart Fine became the keeper of the flame at Mercury, working tirelessly and with an uncompromising will ("the iron fist inside the velvet glove" is a phrase used by more than one associate who worked with her) to preserve the sound of the Living Presence Recordings, which, essentially, she oversaw (with eagle ears), while her husband, C. Robert Fine, provided the engineering know-how to create a simulacrum, which was, at heart, as closely faithful to the original as the technology allowed. All of this was done with minimal miking and jiggling with the signal. Because of her musical training, both in college and afterward (in Dallas and Minneapolis with Dorati), she subscribed, undeviatingly, to the concept of music itself, the absolute sound, unamplified music occurring in a real space, as her final reference. As a result, virtually every one of the Living Presence issues is a prime example of the recorded art. They were then, still are now, and will continue to be touchstones into the future. Established in 1967, the Trustees Award Special Merit Award is presented by vote of The Recording Academy's National Trustees to individuals who, during their careers in music, have made contributions, other than performance, to the field of recording. In these days firmly into the 21st Century, we find the music world in great upheaval. Leaving aside the actual sound and its creation, the recording-and-distributing end is pretty much chaos right now. Record sales are declining in all arenas, artists are self-publishing and self-distributing, and there is a great cry from all sides asking questions beginning with "How?" and "Where? ", to say nothing of the big "Why?". It is all confusing, especially to those of us who grew up with stability and certainty in the industry, and to whom vinyl records were a way of life that filled our ears with wonderful sounds and our living room shelves with artistic splendor. No matter what happens in the future, we can (and must) look to the past with immense gratitude for simply making so much material available in so many formats. 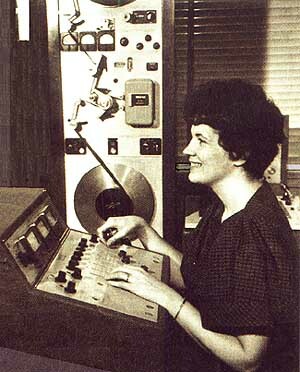 One of the pioneers of the recording industry is Wilma Cozart Fine. Beginning in the era of mono LPs, she worked tirelessly to build a catalogue for Mercury Records. Those recordings live on through her own re-issues, first on LPs and later on CDs, and allow us to learn from and enjoy these sonic images from days gone by. In November of 1995, she was on a tour of various cities to promote her legacy, and I had the pleasure of being able to chat with her about her work. She was cordial and pleasant about all aspects, yet she displayed a knowledge not only of her own niche but the entire recording industry. Here is that conversation . . . . .
Bruce Duffie: Are you pleased with the direction the recording industry is going these days? Wilma Cozart Fine: Well, I wish that there was a larger audience for classical music. I wished that, however, when I did the recordings the first time, and it hasn’t changed a great deal. But there are so many more people buying records today than bought them before. I have a hope that more of them would be classic music buyers and people who appreciate classical music. It puzzles me a little bit because so many people do go to concerts, and people who collect records are so enthusiastic about doing so. I always hope that one of the things that all of us who make classical records will be able to do will be to recruit a growing audience, in particular, an audience of younger people. BD: Does it please you that a lot of the recordings you made many years ago are coming back and are used in that recruitment process? WCF: That’s one of the main goals in the way we have planned the re-release program, the record clubs we have planned, the artists we have reintroduced. I have tried to keep each release in such a way that it would introduce either a different aspect of an artist’s repertoire and artistry, or would introduce a new artist. It may take me a little while to get around to them all, but that is one of the goals which we have been trying to achieve with our re-release of the Mercury Living Presence recordings. BD: The Mercury Living Presence catalog was available on LP, then it disappeared for awhile and now it’s coming back. Will there eventually be a time when everything in the original catalog is back out? WCF: We’re certainly aiming in that direction. We may run into trouble with certain ones due to deterioration or the condition of the tapes. The truth of the matter is, as with all recording projects we will release them as long as we have them and as long as the public wants them and buys them because Mercury Living Presence re-release program is an expensive one for Phillips. As long as the audience appreciates what we do and buys them, then we will continue to go through the catalog. We are very fortunate in that we have a large core of very loyal collectors and it was their insistence which was the reason the re-release program started. They wrote and requested this again and again and again. So they are very helpful to its ongoing health on the market and also have recruited many new fans. BD: How late was Mercury still recording? WCF: Our last recording, I believe, was made in 1967. BD: So you have from 1950 to 1967 to do. Will you also be releasing some of the mono recordings? WCF: We will at some point. We’re not quite sure when that will happen but we certainly will because they’re very historic performances. BD: Even if they duplicate repertoire? BD: When you make a compact disc out of the tapes which were originally pressed onto LP, is there ever any desire to tamper with the balances or the acoustics or anything at all from the original? WCF: Quite the opposite. What I strive for and work very hard to achieve is to actually recreate in two channel form the exact sound of the original three track master. That was the goal whenever we recorded the LPs and released them on an LP and that remains the goal for CD as well. BD: You have stated elsewhere that the conductor had the final say about such things. Was the conductor in each case pleased with the LP as it was issued? WCF: We would not release it if he had not been. The conductor always had musical approval and we also had him available, or we were available to him, to listen to as many playbacks and he chose to at the time of the session. We used the same three speakers and the same tape machine that I later used to re-master the LP or the CDs. So when he heard the playback at the session, he heard it over the same equipment exactly that we would be using in the studio ourselves. BD: Does it ever occur to you during the recording process to think about the people who would be listening in living rooms and bedrooms with different acoustics. WCF: Oh absolutely. As a matter of fact, that is with you all the time. What I have done through the years is try to stay with the same equipment, both for mastering purposes of LPs and CDs and for playback purposes, that I have used over the years since the time of the original sessions. So that whatever works with the public, under whatever listening conditions they were hearing recordings in the past, I have relied that that would also work for today. There isn’t any way, when doing a recording and re-mastering, that you could take that into consideration. The only thing that I can do is an honest recording of the performance itself and try to reproduce that accurately. The problem of how it’s heard in the home or as its broadcast over the airwaves or heard in the car is something that the producer or the manufacturer cannot possibly engineer, cannot possibly have control over. We just want to bring home something that’s an honest replication of that performance. BD: Should there be a booklet of instructions telling them how to set the equipment? WCF: Well, disregarding the question of one’s pocketbook, a part of the pleasure of listening to records, I think, is that people’s ears are different. Regardless of what we would tell them, there’s no way we would know what that person would like to hear, and if that person would really enjoy it. We hope that serious record collectors bring them home and listen to them carefully. They will come to what they like. If you listen to it long enough the music will tell you how to fix your equipment. That’s how it tells us where to place the microphone and how to manage the sound when we’re doing the session. We listen to the music. That’s how we know, and I think that serious listeners do the same thing when choosing their equipment and setting it up. 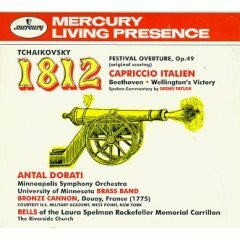 BD: Most of the recordings are simply the music brought to the public, but the 1812 Overture has a lot of effects superimposed. Was the conductor, Antal Doráti, pleased with the product as is came out with all the cannon shots? WCF: Yes he was, as a matter of fact, his very great musicianship, his abilities as the conductor, his very lively imagination and his great sense of fun contribute more than I can say to both of these performances, because everyone knows of his performances of the repertoire of Tchaikovsky from the Nutcracker ballet to the other ballets to the symphonies and the suites to all the others, so that’s a given. When we proposed to do Wellington’s Victory, he entered right into the fun of that as well, and had great joy and pleasure in where we would put the three orchestras for the recording sessions. He had no end of chuckles with all the difficulties of placing the cannon shots exactly where they should be, and the care which we took to make one louder than the other at a certain point. In all of the musical work we did with the effects -- I call it choreographing -- he was very amused by all of that. BD: And the public responded to it! WCF: I think that sense of fun and that sense of joy as well as the respect for the music, on his part, comes across in the performances very clearly because the performances have always been praised. The performances have not been lost in the eyes or ears of reviewers to the effects. I think it’s because the performances are so good. He does them. He doesn’t play it as though he’s played it so many times “…do I have to play it again.” There’s not any of that. The performance is alive; they’re both truly works of celebration which indeed they are. BD: I understand there is a direct Chicago connection to the beginning of Mercury. WCF: That’s true the Mercury records corporation began in Chicago and had its head offices here until it was purchased by Phillips in the 1960s. I came to work for Mercury in 1950. I was in the New York office but I was back and forth to Chicago a great deal of time, and when we undertook a serious classical music program, the Chicago Symphony was the first artist that we signed. The first recording which we made was Pictures at an Exhibition conducted by Raphael Kubelik. The sound was described as being "so lifelike it’s as though you were in the living presence of the orchestra." That’s why these recordings have been called Mercury Living Presence recordings. BD: So it’s your job as the engineer to bring the listener at home into the concert hall. WCF: First of all I’m not an engineer. I’m more a music person who works with the engineer. I’m what is called, today, the producer, but yes that is our job. For these recordings we had a very wonderful team of people who made most of the catalogue. We worked consistently together and everybody had a part. It was really truly teamwork, and what we were trying to do was to let the listener hear the performance as it actually sounded in the concert hall. Orchestra Hall in Chicago, of course, was wonderful for that. It has since been redone as you know, but oh, at the time when we made those recordings it was marvelous for recreating the atmosphere in which the performance took place. BD: You were involved in the recordings as they were happening and again in the reissues. Are you involved in any new recordings now? WCF: No not at this time. You can only do one thing at a time. An archival project, like any kind of recording activity, takes a lot of time and is very demanding and requires a serious commitment. It was this way also when we were doing it the first time as well. Now we’re coming back to tapes some of which have stayed on the shelves for nearly 45 years. When we made those tapes nobody really knew whether they would be here 40 years later because it wasn’t known. Tape was fairly new at that time, the use of it was new, and we had no idea how long the tape would last. We have been fortunate that most of the tape we used for recording has held up pretty well. In fact the problems which we had usually are due to the splicing tape which was used, because the glue runs through and gets on other layers of the tape and causes damage to the tape. But not the tapes themselves; they’re fine if it were not for the glue. But they require care. The first thing I have to do, when I plan a CD, is locate the masters. Some were kept in the US and some were in Holland. I have to find out where the master is, and I have to have the original master from the session. Then I have to find out what condition it’s in. BD: If there’s a recording that is well known and you want to bring it back out but there’s a problem with the tape, would it be possible to get a pristine copy of the LP and work from that? WCF: Whenever you’re working with old recordings, you have to use what you have. It all boils down to that. As a matter of fact, finding your best source is one of the most important decisions which you make in the whole project because, for some records, you may have several different versions. In Mercury’s case I might have the original tape which is always my first choice. I might have a half-inch tape which I made at the time we were making the LP, which would be a mix from the three channel to the two channel. But going back to the days when the tape I made that from was new and it was a mix that I made, you can consider that. That would not have splices in it and so it might be a choice which I might have to make on some of the recordings. On the Capriccio Italien which is on the 1812 and Wellington CD, for those sessions we recorded a binaural master and a three-track master because at that time we were testing whether we wanted to do two-channel or three-channel stereo recording. We did not have two three-channel tape machines because the first one of those was made for us. We had only the one at that time and we wanted to test it before we ordered more. The three-channel tape for Capriccio Italien wasn’t available anymore, so I used the original binaural master for that. So the choice of source is a very important decision and you have to line up what you can, as long as you have the originals. I always choose that, but if I have a problem or I don’t have that, then I have to go through and see what I have. BD: And most of the sessions were the three-mic setup? BD: How did you decide to distribute three channels into two channels? WCF: If you notice, with the Mercury records, you always hear the center, but it isn’t really there. It has been combined into the left and the right, and done in such a way that the illusion is complete all the way across the stage. In other words you don’t have a hole there. You have the winds sitting back where they would when the orchestra was in its normal seating on the stage. I try to recreate exactly what that microphone picked up at the time of the session. Sometimes it’s not always the same and also the acoustics of the hall determines how this works to a great extent. How close the mics are to each other is greatly influenced by the acoustics in the hall, so it’s certainly not an arbitrary thing. BD: When you’re making the original recordings, how was the record format decided? WCF: We were very fortunate, because when we started this program it was in the early days of the LP so everybody was redoing repertoire. That was also the time when a lot of the recordings from abroad were first being imported into the states again after World War II, so we had a wide field from which to choose. Of course you always want to record what you think your artist will want to do. You consider what the artist is best at. His or her specialties are what some of this hangs on. You think what you do best, you think of what the audience might be wanting, which works hadn’t been on record before, and you think about what you, as a company, do best. For example our sound was always a very strong selling point in our recordings, so we liked to record things in which some extraordinary sonic result would be what you needed. WCF: Well, you also have to think about the cost. Even in those days, to make new recordings with a symphony orchestra was a very expensive project. To make classical recordings of any kind was expensive and we had to think about what sells really well. We did some solo recordings, of course, and we did some chamber music, but not as much as we did orchestral. We did an extraordinary amount of contemporary composers and their works. We did the American Series when nobody was recording that repertoire at all, and we did a very wide coverage of American music up to that time. Sometimes the ink was wet on the paper when we’d start. So we tried to do it that way. BD: If you were starting out in 1995 to do this project, what would be the same and what would be different? WCF: Because so much of the back catalog of all the labels has been released on CD, there’s not the wide choice in repertoire. We had so much of the catalog available when we did it the first time, we did not only first recordings when they came out in the market but in many cases it was the first performance of it as well. In other words we were recording the piece the first time as it was being performed. Because Doráti commissioned new music wherever he was the conductor, we recorded some of that. [Note: To read the interview I did in 1985 with Antal Doráti, click here.] He also did music which was rarely played then, and of course there were no recordings of it. So that opportunity that recording companies are searching for now doesn't exist as it did then. That’s one of the differences between then and now. Another is the way the public and the record labels feel about contemporary music. Now audiences, to a certain extent, and record labels and artists and programmers everywhere, concert and otherwise, are looking for new music. They can record it and people can get to know it, but I think the main problem today is that there is so much recorded music available. BD: Would you say there's too much? WCF: Well I don’t think there’s ever too much, I really don’t. We’re so rich. I think it’s a glory that it’s all there, and I hope that it continues and that we get the audience for it. But if we were doing it with a label today, you would have to choose very carefully, and I do think the final test is quality. I've always thought that. If you’re doing the label, you need to think about what can you do the best, and make the choice with that in mind. BD: Do you ever feel that you’re in competition with live concerts? WCF: No, I don’t really, I think they compliment each other, in all honesty, and in fact I can’t imagine that anybody would really think that, because going to a concert in one kind of experience, very rich, very wonderful, and listening to a recording is another. Just think about it. If you do a concert and see an artist there on the stage you see this being done live and it’s marvelous, you love the artist you love the piece. If you buy a recording, even if the same artist has recorded it, you can go back and study it, you can play it, you can track different places, you can hear things as many times as you want to. Then if you enjoy it, you can listen to it any way you want to - in your pajamas, after dinner, when you first get up in the morning, whatever. If you also want to know how another artist might play it or interpret it, you can go buy another record. You might not be able to hear that artist again. The person might not be around anymore, might not be performing anymore or might not be performing in your city for several years. With records, I find they compliment each other. BD: Will you be releasing the things which were recorded in Mono? WCF: When I release those Monos I want to see what condition the tapes are in. I want them to sound as good as they can possibly sound. You know we have a lot of people who absolutely swear by the sound of the Monos; they love the fact they are so focused. If there is only one microphone correctly placed it is FOCUSED you know, they like this very, very much. I want, when I bring them out, for them to sound as good as their most wildly enthusiastically fan says they sound. That’s what I want. Not to be gimmicky but to be good. BD: There are still some people who swear by the LP; they say it’s warmer than the digital. Obviously you don’t feel that or you would re-release on LP. WCF: I think this is an argument which is false in concept, first of all, because I don’t think there’s an argument about that. Those are two completely different things. BD: Should you have then the LPs and the compact discs? WCF: That would be hard to do because the LP market, in spite of its enthusiasm, is a relatively small one. But it’s a nice part of the market for classical repertoire, not belittling the numbers because they are what they are. But the argument that CDs are better than LPs is not the question in my opinion. The crux of the matter is, again, the original recording because if you’re trying to judge a technology by the time it gets in the home, a lot of things could have affected it. If you said that you don’t think a CD is as good as an LP but you didn’t relate that to specific repertoire you could say that, or you could say a CD is better, but even then it’s not really valid. They aren’t played through the same chain, they’re not played through the same system. I do think that analog recording is the best thing there is; there’s no question about that in my mind. I think it’s absolutely wonderful, but I don’t think that it’s better when it gets to you in the home, because a lot of things happen, including what you’re playing it on at the time. The fact is that you are going to have some surface things, probably, when you play a record. If they didn’t happen before you opened the record, they will happen by the second time you play it or probably before you get through it the first time. One of the reasons I feel that Mercury CDs have the quality and the sound which they do is that they come from an analog source. The second thing is they are made for CDs as far as they can go through the change from tube equipment. No transistors. Those are two of the distinguishing influences with the sound and I’m very happy that they do come from analog originals. BD: If you were on a desert island and you could take one of your LPs in its original condition or a CD, what would you select? WCF: I use the LPs all the time when I’m mastering. My first check of course is the tape itself. When I’m going into the digital mode, I check it against .the analog original and I check it against the LP. The LP is closer to the original, but the CD is closer to the original than it is to the LP. You can check certain things, you can see whether the balance is the same, but I don’t think that has any bearing because, in some cases I know my CD balance is better. And I know in many cases the CD level is better. On the other hand, there are certain LPs which I have to work very, very hard to get the CD to be as good as the LP. But I keep at it. I keep trying until I think I’ve done it. What I think about that is very much the same as I said in answer to your question about recordings interfering with concerts or concerts interfering with recordings. I think record buyers are very fortunate to be able to buy LPs and CDs. Quite frankly, right now in this era, when you’re able to buy some LPs newly produced that you couldn’t get before, you can buy Mercury LPs which are made with the care they are. You should buy both and be very happy because if they’re the ones you like, you have whichever of these two formats pleases you most. That’s what I think. BD: I think there’s one thing that the CDs you’ve produced have that no other CDs have, that’s love. WCF: I certainly don’t think I’ve cornered the market on that, but they do have love, that is true. BD: Are you pleased with where your career has taken you thus far? WCF: Oh yes, I’ve had a wonderful time. I’m so fortunate to have been able to work with these wonderful artists over the years and know them, and to get to know first hand as much music as I do. You do learn it whenever you record it because you have to take it apart and put it back together from so many vantage points. I do love music with all my heart and wanted to work with it since I was a child. I consider myself really so fortunate to have had the privilege of doing that. I enjoy it just as much now as I did when I first started. WCF: As long as the public likes the Mercury Living Presence recordings I hope I’ll be able to continue doing them with the greatest cooperation and support of Phillips. They’re very supportive of the series and I think they are proud of the catalog. BD: Thank you for sharing all of this with us. WCF: You’re certainly more than welcome. My pleasure. This interview was recorded in Chicago on November 20, 1995. Portions were used (along with recordings) on WNIB in 1996. This transcription was made in 2007 and posted on this website at that time.